If there’s anything like a birth photo of Boston College, it’s the one on the page opposite. 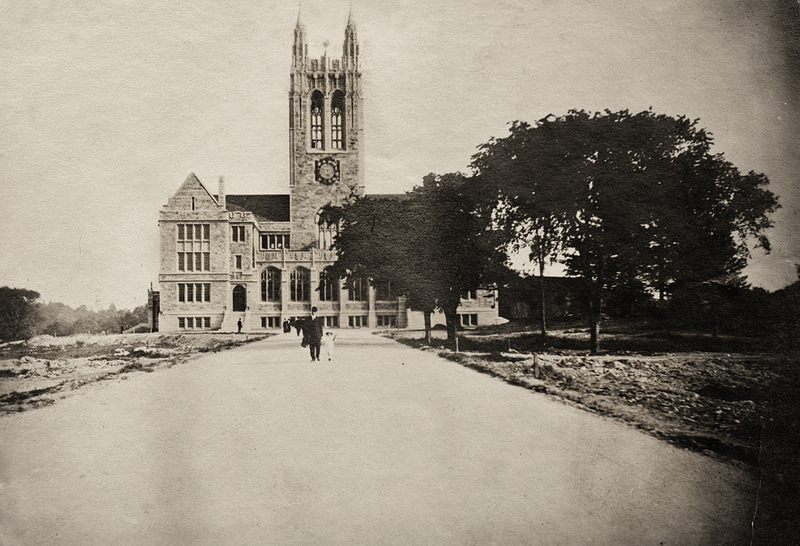 The picture is of a near-completed Gasson Hall and dates to 1913, half a century after Boston College was in fact born into a four-story brick building on a small plot beside a large church on an unpaved street in the south end of Boston—not yet the desirable “South End,” but the bottom of it all (the school and the church were nestled into an older “pauper’s burial ground”). Boston College’s archives contain scores of photos dating back to the south-end era: unsmiling Jesuits in cassocks; boys and young men dressed for class or baseball or Macbeth; alumni gathered in hotel ballrooms for a feast; and still-life portraits of rooms trimmed out with the latest in glass and steel science paraphernalia or wood and leather gymnastics equipment. On the day the photograph opposite this page was taken, however, the Boston College captured in those earlier images was done for, on the point of shedding its high school (the college and a secondary school had cohabited from day one) and its unfashionable location for a shot at a real college existence on a real campus: 31 acres of farmland atop Chestnut Hill that were “almost intended by nature for the site of a large institution,” as a realtor murmured in the ear of an early Boston College president. There would flourish “the greatest Catholic college in America,” according to a 1907 call to arms (and fund-raising) by Thomas Gasson, SJ, the president who bought the land and who publicly dreamed of a 15-building English Collegiate Gothic enchantment overlooking Boston. I’m guessing it’s Sunday. Saturday was a workday in 1913, and there are no workers in this photo, only some well-dressed tourists, out for a stroll in the country (the twin reservoirs were a popular outing), who decided to get a close look at the piece of medieval Europe that had sprouted on a barren hill overlooking the city. They may be all one family: the man walking alongside his little daughter; two women in scalloped Edwardian dresses and hats; another bowlered fellow standing in the distance and gazing at the building, leaning back, his hands clasped neatly behind him, like a serious man getting a look at his first pachyderm. After Boston College was founded in 1863, three years passed during which the Society of Jesus called it Collegium Bostoniense Inchoatum. The daring of Frs. Robert Fulton, Timothy Brosnahan, and Read Mullan, the Boston College presidents who along with Gasson were responsible for this photograph, is that after Boston College was quite solidly formed (the largest high school and college enrollment at an American Jesuit school) they conceived of a superior form, and temporarily returned Boston College to inchoatum, as in this photograph. One day soon after the day captured here, workers will enter this scene and put hands on the clock and start time.